At the end of last year, I finally took the plunge and joined the DC-area bike share: Capital Bikeshare, or CaBi. My red key arrived in the mail, and the next day I used it for a multi-modal trip to work. I drove to the Arlington Trader Joe's and parked there, hopped on my first CaBi and rode to Roslyn, took the metro to Metro Center, and walked to my office. Then the Polar vortex descended, and I was not up for full bike commutes to work, but quickly discovered that I enjoy hopping on a CaBi for the few short blocks between Metro Center and my office. It beats walking or changing trains for one stop. 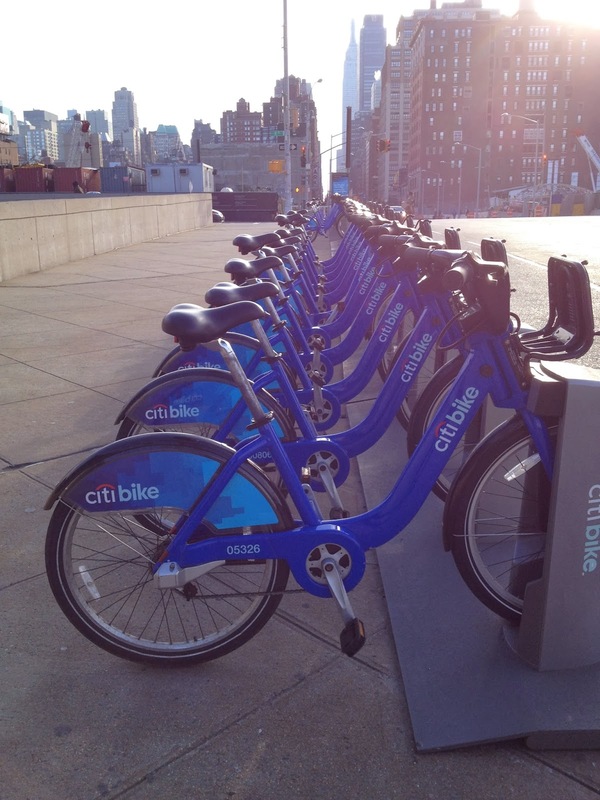 So with my newfound bikeshare savvy, I looked forward to a spontaneous MLK weekend trip to New York as an opportunity to check out the Citibike controversy first hand. Yes, controversy. 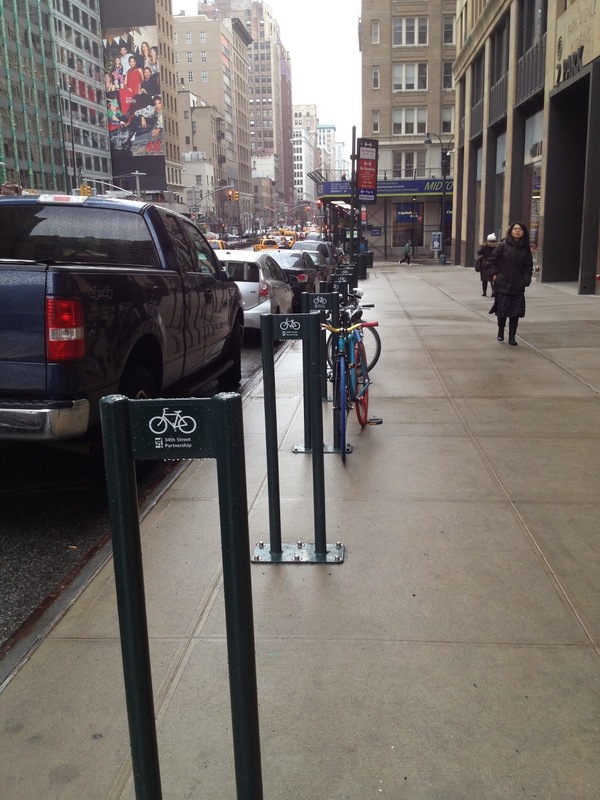 Some contingent of grumpy New Yorkers objects to the bright blue bikes and the space they take up on the street. Well, they are bright. The blue does seem to catch the eye more than the red CaBis. And each docking station holds way more bikes than any I've seen in DC or Arlington. Ours seems to hold about 15-20 bikes. The ones in NY - more like 40. 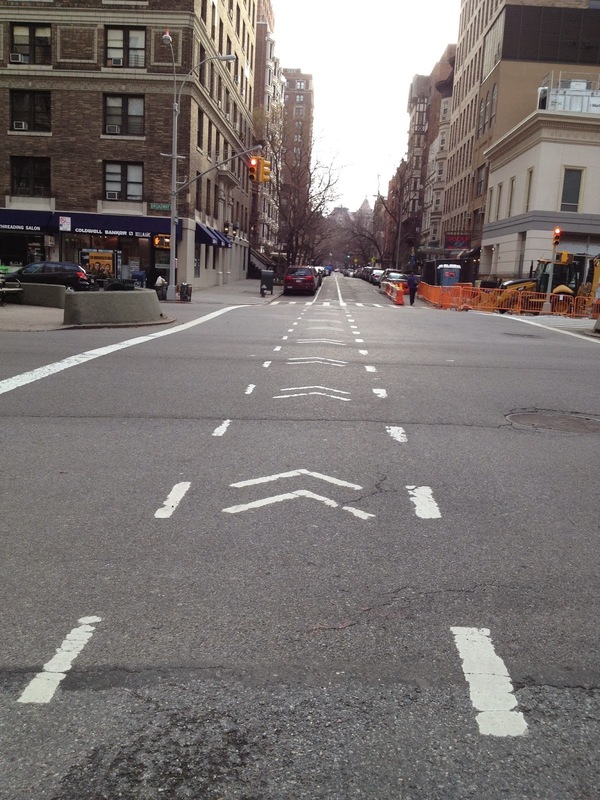 There was a time, not so long ago, when I would have thought anyone crazy to risk life and limb cycling in Manhattan. 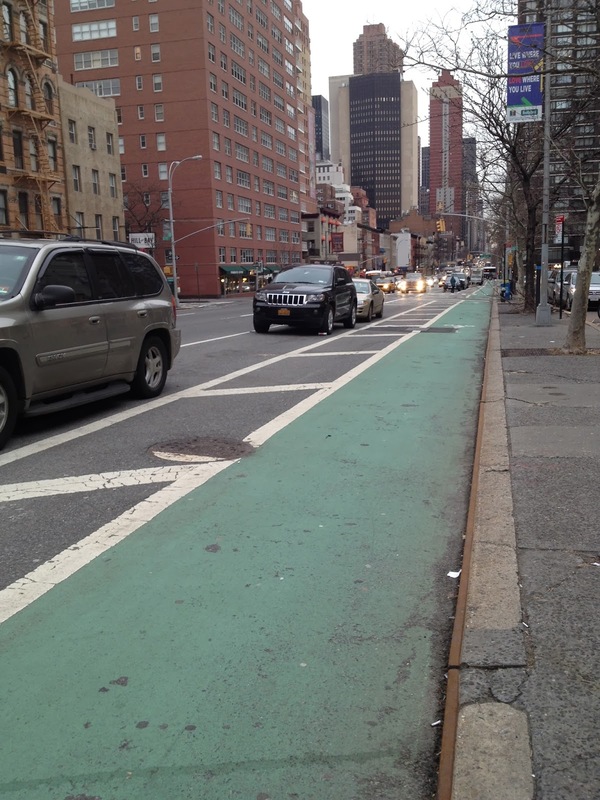 But I knew a lot had changed in recent years, and I wanted to check out NYC's protected bike lanes, which I've heard so much about, in addition to the Citibikes. I figured a cold Sunday morning would be the least hazardous time for my maiden voyage. 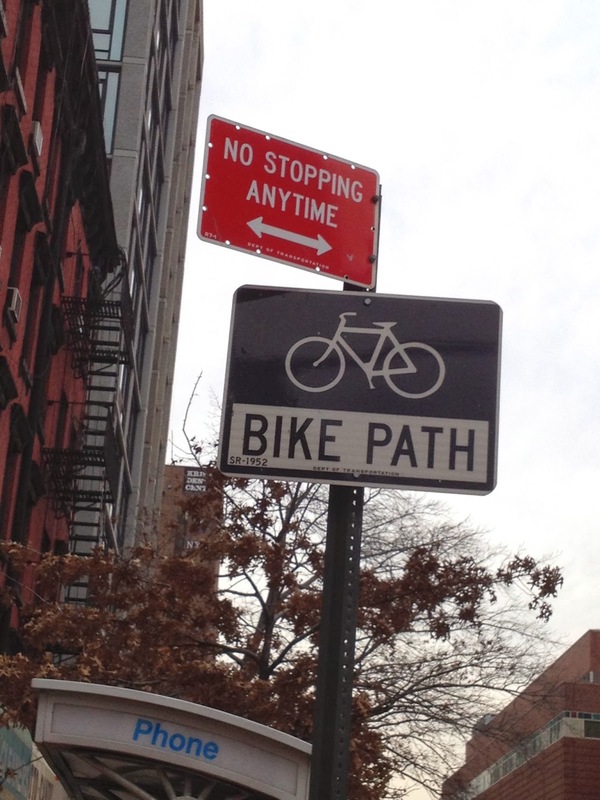 I walked the Cycling Yogi to his $2 Bolt bus to Philly, leaving from 33rd and 11th. I'd already downloaded the app and checked out the abundance of docking stations in the lower half of Manhattan. 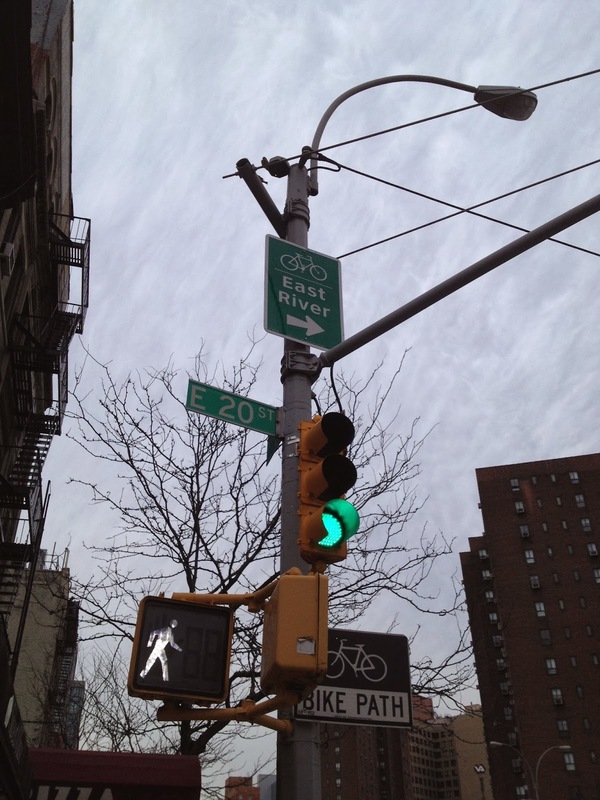 I picked up my first bike at 34th and 11th, going west on 34 where I'd seen an entry to the bike path running along the river. It's easy to go a long way on a bike without noticing it. 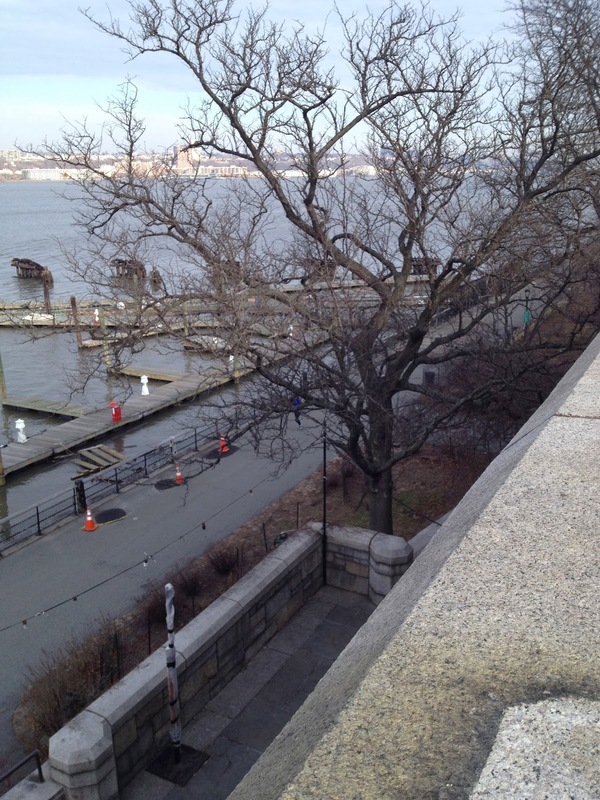 At 59th St I veered off the river path to ride through Riverside Park, up to 79th St. I could have gone much farther, but I had to redock the bike within half an hour, or incur additional fees, and there were no docking stations above 59th St. 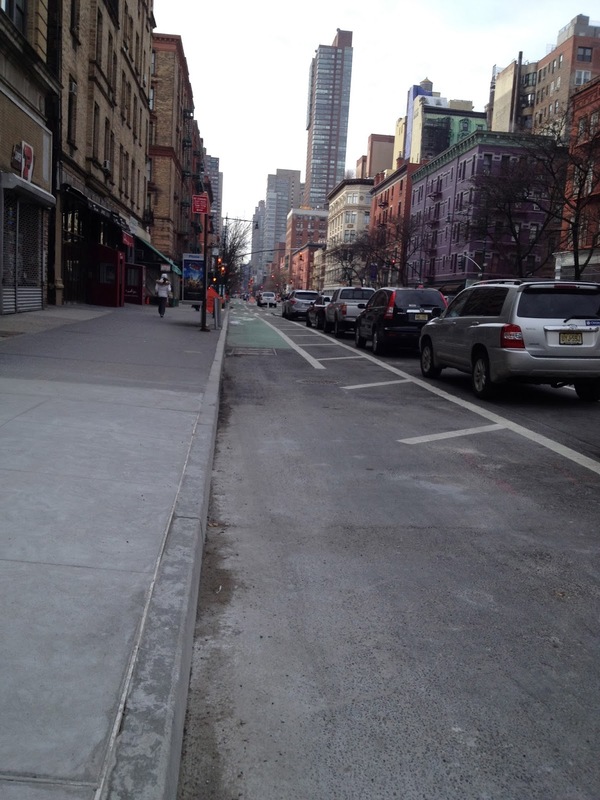 I rode west to Columbus Ave, where I could take the protected bike lane south. 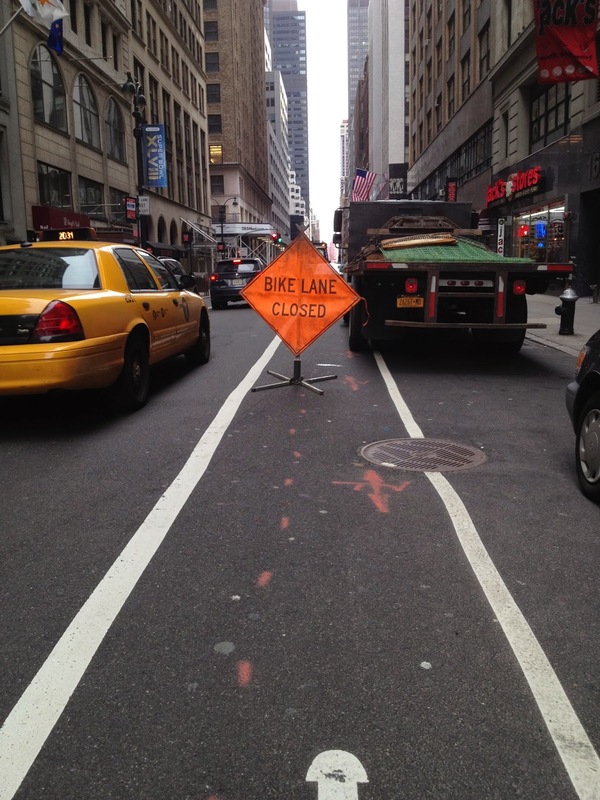 I felt completely safe with a physical barrier between the one-way bike lane and motor vehicle traffic. I also appreciated the traffic signals that clearly indicate when bikes can proceed, and when they can't when cars have a left turn arrow. I'm not sure whether I exceeded my half hour before I found a docking station just south of Columbus Circle, on Broadway. I walked from there to where a large line was forming at the TKTS booth. I got in line, figuring I'd wait till 10:30, when they would post the discount shows for the day. Alas, there were to be no tickets for the shows on my list, so I hightailed it over to the theater where Once is showing, joining the (yay) short line of thrifty theater goers waiting for $40 rush tickets. It was a long cold wait, but the time went quickly talking about Citibike to the fellow behind me in line. He showed me some helpful features of the app, and I gave him the ins and outs of buying rush tickets - so we had a fruitful information exchange. After about 45 minutes, my fingers were just about numb, so I was grateful when his wife showed up and went on a coffee run for us. The hot liquid was a lifesaver! We were happy when the box office opened at noon, and we got our cheap tickets for the 3:00 show. 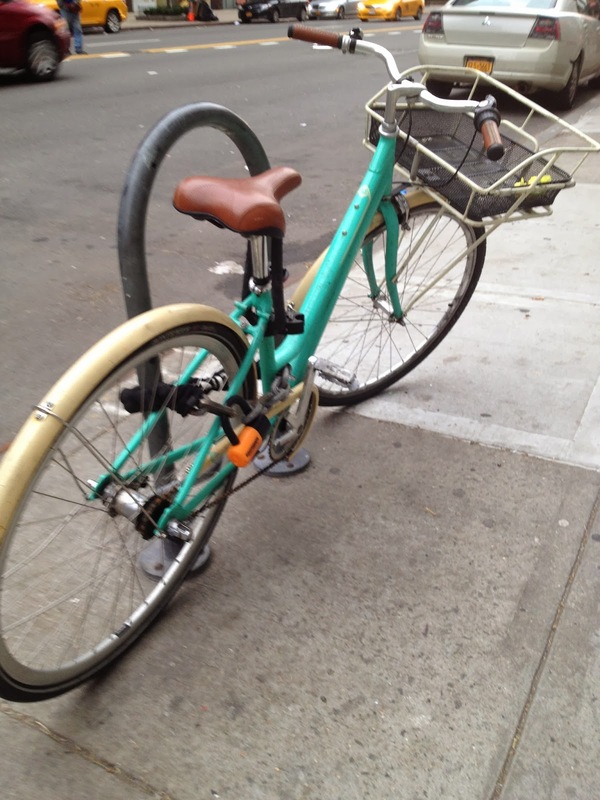 Then my mishaps with Citibike began. 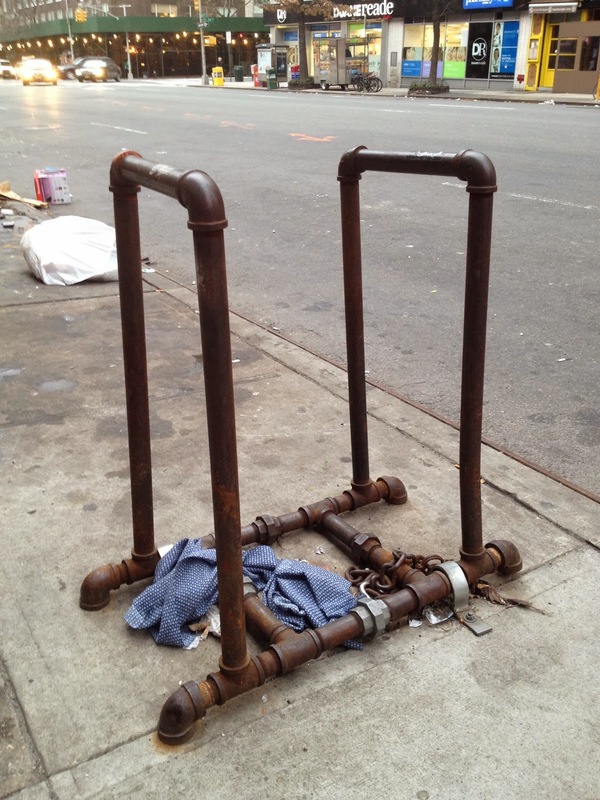 The station on 45th and 8th by the theater had plenty of bikes, but the credit card reader was broken. When you use a one-day pass, you need to swipe your card each time to get a new unlocking code. By the time I'd walked to the next station, I was halfway to my hotel and it wasn't worth it to bike. But I figured I'd bike back to meet my friend Sarah for lunch before the show, after warming up a bit. 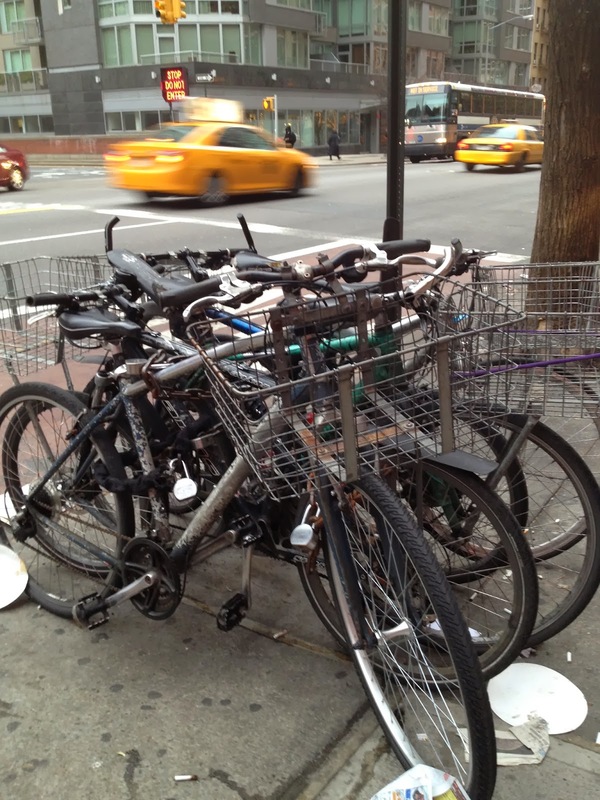 Here's the thing about Bikeshare docking. The bikes are really heavy, and to get them into and out of the dock you have to lift the front of the bike to unlock or redock it. For me, it's not easy. So, in my anticipatory haste to wrangle the bike out of the dock near Grand Central Station I started lifting up before the green light came on. That's a no-no, and I couldn't remove the bike. So, I figured, ok, I'll just get another code and try again. Wrong! The machine told me I could not get a new code for a other two minutes. Boo! So I just walked. On Monday morning I figured I still had a bit of time left on my 24-hour pass so I took a little ride on the east side, cycling south down 2nd Avenue's protected bike lane from 33rd to 14th, and then back up on 1st Ave. The streets were quiet and, again, I felt perfectly safe. The other Citibike glitch was that, nearly every time I swiped my credit card, the machine told me I couldn't use my card. Each time, I swiped it again, and was fine. Is it possible that the problem was that I used a Chase credit card, and not a Citibank card?? 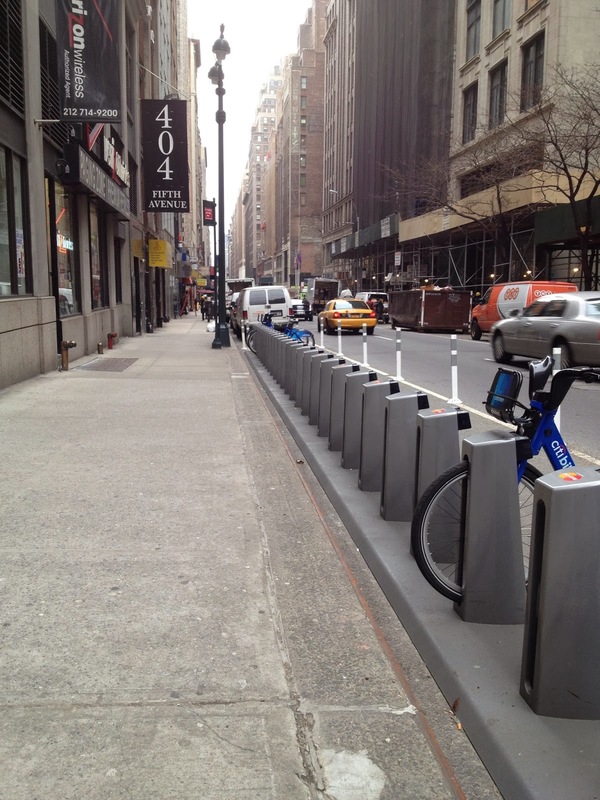 But here are a few nice features about Citibike. 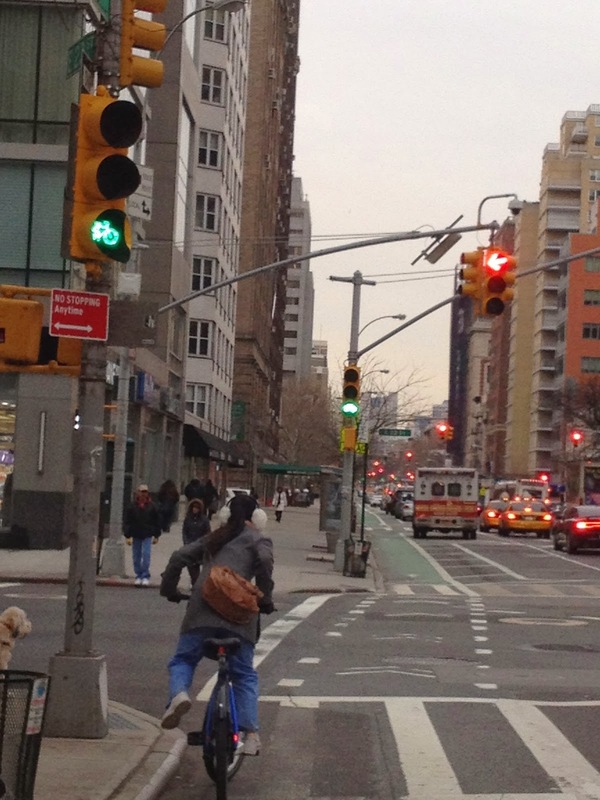 The Citibikes have a bell! I like that. Some of the docking stations are arranged to return the bike at an angle, which is easier than maneuvering the heavy bike straight into the portal. Yeah - don't stop your car in the bike path!!! 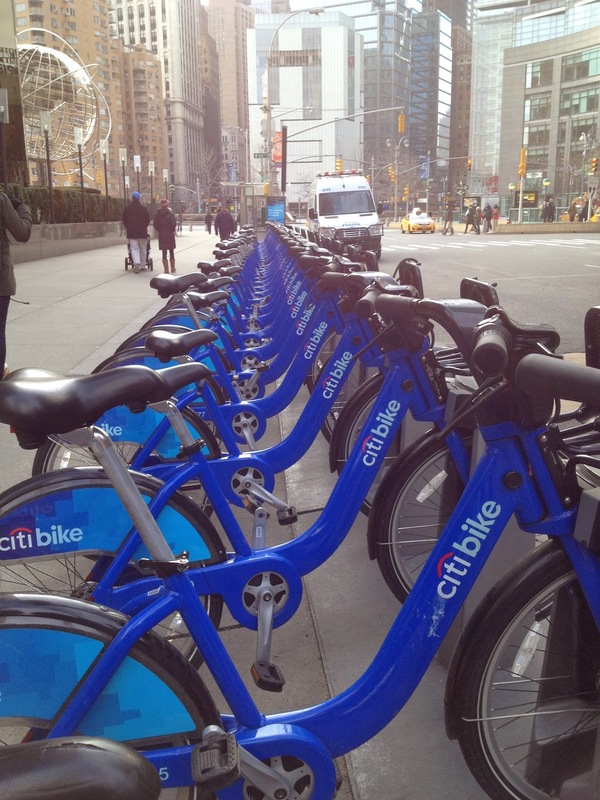 I had written a diatribe about how much better the Citibike app was, compared to the one for CaBi. Well, it turns out I just hadn't learned to use the CaBi app very well. Both apps show both the number of bikes and the number of empty docks at each station. Both will also show bike routes, although I'm not sure whether the CaBi app shows where there are bike lanes, as the Citibike app does. That's something for me to check out. I've also found that some bike seats are simple to adjust (as they should be) and others are nearly impossible. 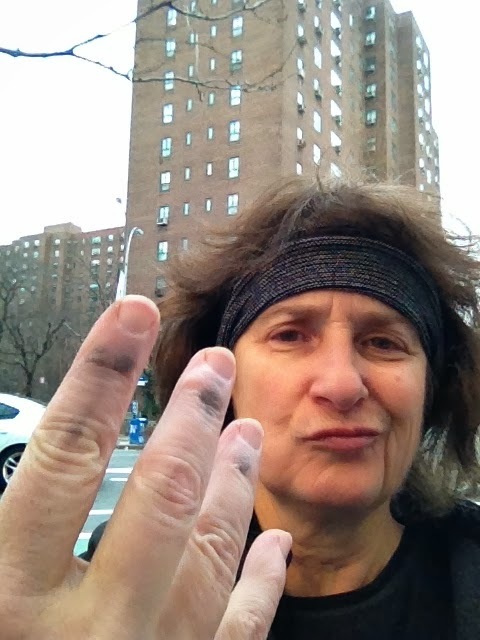 Note the greasy hands on my first photo after (unsuccessfully) struggling with one Citibike, before giving up and selecting a different ride. I've also gotten a CaBi on which the seat adjuster poked me in the leg with each pedal stroke (ouch). There's probably a simple fix, but I haven't figured it out. All-in-all, I had a lovely time biking in New York, and when I wasn't biking, I was taking photos of the fabulous bicycle infrastructure and diversity of delivery bikes that are ubiquitous on the sidewalks of New York. You can’t count on ski days in Philadelphia any more. In a good year, we’ll get three or four of them, but two winters ago we had none at all. So when I woke up this morning to 8 inches of snow on the ground, I knew it was a special day. After a symbolic pass at yoga stretches, I decided to shovel the walk before meditation, and by the time I got to my friendly neighborhood sangha, the 6:15 sit was ending. I sat briefly, but the woods were calling – lovely, dark and deep. I was the first one in the park, skiing on virgin snow except – except there was a single track all along Forbidden Drive, the mark of a one-legged skier, I thought, or perhaps it was the tail of a woozle. And I kept imagining who it was had preceded me, with this single-runner track through the woods. There were footsteps on either side of it. But the footsteps were too far apart, I noticed. And with time I became aware that they didn’t reach to the bottom. They were depressions in the snow, but no one had put the weight of a foot into them. Decades ago, I was the Boston area’s only bicycling piano teacher. I would cycle from my home in Watertown to teach my students in their Wellesley homes after school. When it snowed, I had no other transportation and no other income. But bicycling in the snow was dangerous, slow and uncomfortable. Mountain bikes hadn’t yet been thought of. But now, I see, there’s specialized equipment.